An innovative rotating exhibition space located at Montefiore New Rochelle, The Queen City Art Gallery is collaboration between the Montefiore Fine Art Program and the New Rochelle Council on the Arts. The gallery exhibits original artwork and is open to all artists living and/or working in New Rochelle and Westchester County. This rotating exhibition program seeks to enrich the lives of the patients, caregivers, associates, students, faculty and the community’s understanding of contemporary art in a medical center context. The Queen City Art Gallery strives to support Montefiore’s mission to heal, teach, discover and to advance the health of the communities we serve. Exhibitions feature a wide range of artwork with diversity in theme, medium and execution that appeals to a wide audience while being respectful of cultural backgrounds and the New Rochelle community. Montefiore New Rochelle will sponsor three exhibitions annually. People take pictures for many reasons. Taking pictures of cherry trees is pure love. When something is so fantastic, so beautiful, a person wants to hold on it, to own its beauty. By photographing these trees, it begins the celebration of spring. I get excited seeing the first few blooms and wait impatiently for more blooms. It's always a long winter and when the trees start to bloom one can breathe a sigh of relief, knowing that winter is finally over. These images were all taken in New Rochelle. Each image shows not only a tree, but also a background, an old bungalow, house, or American Flag in the scene. We are looking at the trees in context, showing variation in shape, color, style and background. Thank you for sharing these images with me. Rebecca Singer grew up in Skokie, Illinois. She began her formal art studies at the Art Institute of Chicago at the age of sixteen and received a BFA at the University of Illinois with a major in Graphic Design and Filmmaking. She worked as a filmmaker in NYC for more than ten years and then returned to photography to earn a certificate from the International Center of Photography in NYC. For many years, Ms. Singer has been exploring photographic collage with traditional black and white photography, manipulating her images in the dark room. For more than 20 years, she has been working in color with the aid of a computer to assist in producing works of art that are available in signed, limited editions. Ms. Singer has enjoyed many awards through the years and has exhibited her work in and around the New York area including The Yeshiva University Museum which holds many of her works in their permanent collection. Since 2005, Ms. Singer has been working with seniors and children helping them to create art, (art therapy,) painting, drawing, photography and needle crafts. The pleasure is in the process of creating. New Rochelle is the city I grew up in and the town that I can call my creative home. I have worked here for the past 15 years and have seen everything this City has to offer. From the Sound, to the beautiful light, the City’s history, the people and the wealth of different cuisines, I have always been captivated to photograph everyone and everything that I see on a daily basis. This exhibition is a pictorial narrative of New Rochelle - our community as viewed through my lens. To capture the city’s character, I chose photography as my medium as it has the power to render unique visual moments and fleeting points in time. Soon enough the city will have a new look and I want to ensure that the unappreciated places and trusted surroundings get remembered. I photographed intuitively and chose the sites that are most familiar to me. I purchase food at C-Town and always get mesmerized by the neatly stacked produce, meats and canned goods. I captured the daily activity on Division and Main Street, an intersection at the heart of the downtown that I cross nearly every day, carefully. I tipped my hat to City Hall, perhaps a partly romanticized image, and then moved on to photograph the oasis of Hudson Park on a crisp fall day. The mural on Beechwood Avenue is highlighted because it has become an icon for the arts in the city. I also included a photo composite of the park behind the Huguenot Children’s Library, a place that has captivated me since I was a child. The flowing stream that runs through the park has strategically placed stones that are ideal for games like ‘jump the brook’. New Rochelle breathes, and looking at the various landmarks and locations in this panoramic style allows the viewer to enter into each pictured space. In short, I have created images in which the viewer can inhale and exhale. These photographs are meant to be appreciated as art that transcend the familiar. 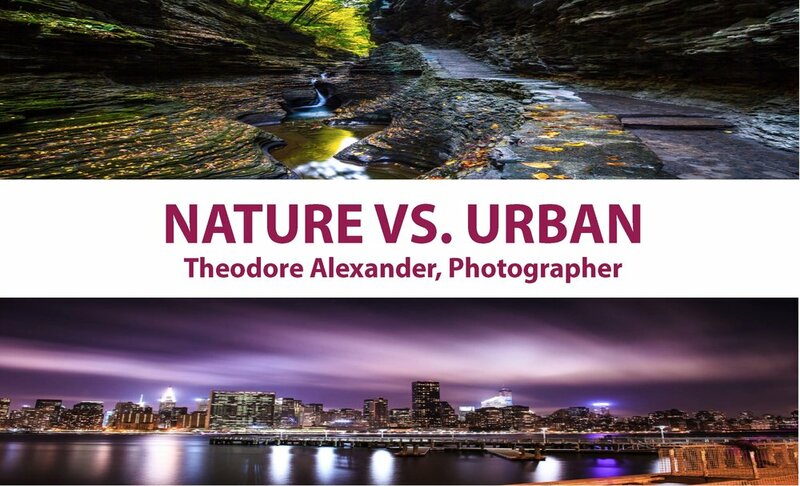 I am a self-taught landscape photographer living in the diverse city of New York. My inspirations are adventure and nature. In this exhibition, I seek to portray both the various landscapes of nature and the cityscapes of Manhattan. I have always been a city boy. I was born in Lagos, the largest city in Nigeria, and arrived in New York in 2003. I appreciate city life, the fast pace and the everyday hustle and bustle. Walking for hours, I am captivated by the juxtaposition of modern and historic architecture. This urban imagery is very compelling and I am constantly driven to capture it in my photography. But I also appreciate the beauty of nature and have explored many areas around the United States and overseas. I enjoy hiking and camping and will travel to the most remote locations in America for the perfect image. Creating art from nature is priceless in my book. My intent is to create a visual representation of a particular scene so beautiful that it motivates any individual to visit the site. My passion for photography brings me an endless source of inspiration and satisfaction that I cannot quite describe with words, so I let my photographs do the talking. After attaining my shot, I utilize Adobe Lightroom to paint my personal vision of each composition. The last stage is printing on various media to bring my photographs to life. This is the true end game and what I consider the 3rd dimension of fine art photography. I am honored to share my photography with the Montefiore New Rochelle community. Please enjoy and I hope to entice you to visit some of the sites I have captured in my work. Burke Rehabilitation Hospital has helped patients recover from serious illnesses, injuries and surgeries. Burke helps thousands of patients each year to regain both cognitive abilities and physical strength through acute inpatient and outpatient programs. Faces of Burke is a traveling photo gallery that showcases some of these remarkable patients--and their remarkable stories of recovery. An exhibition featuring artwork by local New Rochelle artists, Alvin Clayton, Jesse Sanchez, Billboards Hacker and the collaboration of Claudine Nash and Carlos Monteagudo, recognizes and celebrates the diversity and innovation of artists living in the surrounding community.